You’re probably getting excited about your TV wall mount, because it can very easily turn your home into trending space. 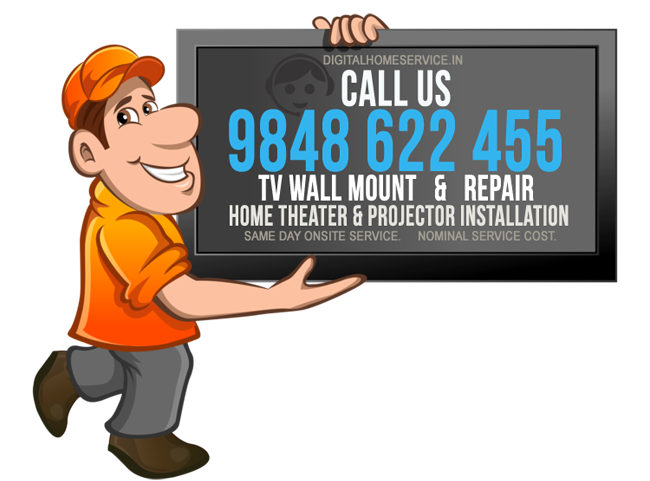 We are TV wall mounting service specialists in Hyderabad & Sec-bad regions, where we take care of your TV wall mounting with proper care and moreover your satisfaction is our greatest asset. TV wall mounting service is our core business and we are specialized in Flat Mounting, Tilt Mounting, Arm Bracket Mounting, Ceiling Mounting etc.,. TV stand bracket can be provided either by customer or we arrange perfect TV bracket for your TV. We offer a comprehensive service in LED/LCD/Plasma TV wall mounting. From wall mounting your TV to hiding cables we have it all covered. We work smarter to make our customers receive a quality of service that continues to build our reputation. We rely on word of mouth as a business. We offer services to all sizes of TVs such as 16 to 30 inch wall mount, 32 inch tv wall mount, 37 inch tv wall mount, 40 inch tv wall mount, 42 inch tv wall mount, 46 inch tv wall mount, 48 inch tv wall mount, 50 inch tv wall mount, 55 inch tv wall mount, 60 inch tv wall mount and above. We offer TV wall mounting services to most top brands like Samsung, Sony, LG, Panasonic, Philips, BPL, Videocon, InFocus, Haier, Vu, Onida, Sansui, Micromax, Wybor, Intex, Mitashi, Konnect, Lloyd, Lunar, Bravieo, Abaj, Activa, Aoc, B2X, BITSON, Bush, CARP, CVT, Daiwa, daktron, Dektron, Dutsun, Elegant, Elegant Germany, Funai, GOLF, I Grasp, ITH, Jack Martin, k2clearvision, Konnect, LE-DYNORA, Mr.Light, MRV, Nacson, Nextview, Skyworth, Soundwood, Surya, Voltguard, Weston, WLD, Worldtech. SERVICE CHARGE: The money we charge is only for the fitting service, material charges will be levied on customer as per the set up. We know your time is more precious to us. We will come to your location as early as possible. For our convenience please book prior possibility time to reach you in a more timely manner. Expert, skillful and patient installation of critical wall-mounting of Samsung TV. Engineer Mr. Reddy is very polite and cordial. Great experience ..awesome work and perfect explanation about the features of home theatre...experiencing now my music system..Thanks much. TV wall mount fitting was very good. Person was very quick in response. He has done installation in 10 mins. TV was Sony Bravia led 32 inches. Your service is awesome and product you installed was on time. Thank you for quick response. The service was excellent. Karunakar amd his team did a fabulous job.Highly recommended.